I LOVE this necklace, but to be honest I had forgotten about it. Then I saw American Hustle and all those outrageous clothes, chunky accessories and that brought it all back - a redux of sorts. A mix of memories of my bold and bubbly grandmother that used to wear this, and an era when designers really relaxed the rules, took some chances and had fun with fashion. The designers at Stella & Dot are having a little redux of their own with this amazing look alike. It's called the Makena Pendant and it's available now as part of the Spring Collection. A necklace like this can turn it up a notch whether you're rocking a simple white T, a plunging neckline, or a funky print, and it's as on-trend now as it was in the '70's. Have fun. Mix it up. Take chances. Be outrageous. I like a big, sassy, fashionable bag as much as the next girl. But if I'm trekking around Disney, a concert, a ballgame or the dance floor, all that bulk slows me down. Sometimes I just want to grab my phone, a little cash, some lip gloss and go! The solution is this irresistible Stella & Dot tech wallet. Like 7UP is to Coke - it's the perfect alternative. It's small, chic and equally stylish and far more maneuverable. Available in a range of hot colors and patterns. Marvelous! Everyone talks about the wardrobe-altering powers of a big, bold statement necklace, but I think you can get equal transformation from the perfect pair of chandelier earrings and they are far more versatile. The size and shape is flattering on everyone, and if you choose the just-right color your eyes will sparkle - and everyone notices that right? 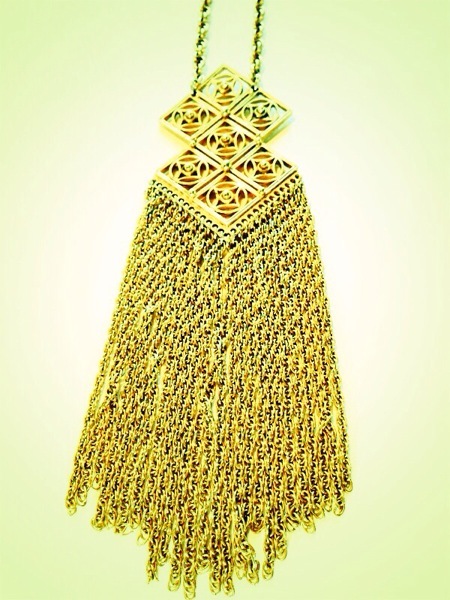 I'm loving these gold Chantilly Lace Chandelier Earrings . They look equally amazing with a little black dress or top, a bright tee (especially orange) and jeans, or your favorite maxi sundress. The matching cuff really completes the look. Shop the entire collection here and add a little flair to your summer style. The only thing I love more than shoes is a fabulous bag. Well, that's not entirely true. I also adore jewelry, scarfs and sunglasses. It's one of my fave things about being a girl - a closet chock full of accessories! I love sporting this one - the La Totale in Espresso Ikat by Stella & Dot, poolside, carry-on, farmer's market and everything in between. It's huge, the wipe-clean lining is both durable and fun, there's a water bottle pocket and the detailing is amazing. Also available in navy and metallic, but only through a trunk show or my e-boutique and several designs are already sold out. On trend and super hot with the fashion magazines and the fashionistas alike, Stella & Dot is only available at Trunk Shows and online through a stylist. Please accept my invitation to shop & share my e-boutique 24/7, and check out these pieces from the summer collection - Juniper Statement Necklace & How She Does It bag. Join me - let's plan your personal style session and talk fashion, fun and free jewelry!